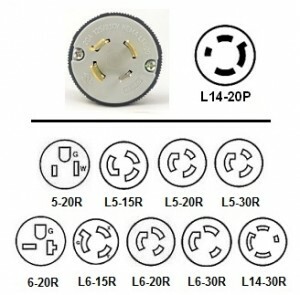 Electrical connections use a variety of plug and socket configurations. In order to plan and price a colocation, you will need a good grasp of your power needs: how much total power will be needed for your co-located equipment stack, and in what configuration? This is the name for the electrical property of current flow. At any given voltage, the total amount of power you use is directly related to how much current is flowing to your equipment. Current is like the volume of water in a pipe – the greater the flow of water, the more powerful the current. Just as water can move at greater volume through larger pipes, electrical current needs bigger wires as current rises. As a general rule, the more equipment you are running, the more amps (current) you will need to supply all equipment with the necessary amount of power at a given voltage. Data centers will provision electrical circuits with a maximum Ampere rating – 20A and 30A are common values. This the name for the electrical property of Potential (or Pressure, if you prefer). Unlike amps, voltage is not something that your equipment will consume in a variable way – voltage is a set value. Voltage is like pressure in a water pipe, setting a baseline of sorts as to how much work can be done – at any give pressure (voltage), the greater the current flow, the greater the overall power. Data centers can supply electrical circuits in a range of voltages according to customer needs: 120V, 208V and 480V being selections for the US. Most modern computer equipment will run at either 120V or 208V and will auto-detect the supply voltage. 120V is still very common in data centers, but in recent years 208V has gained ground in that it offers some efficiency over 120V. This designation refers to how the electrical power is generated and delivered over the wire. Suffice to say that, unless you know that your equipment requires DC, you’ll be getting the (much more common) AC. Single phase vs 3-phase power. Specific to AC power, phase indicates how AC circuits are combined and configured in the delivery of power. 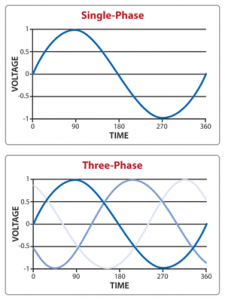 You may have heard of “single phase” and “3-phase” power; there’s a good and brief overview of the differences here. Three-phase power can be more efficient in high-power situations, but tends to be expensive to provision. So unless you are planning a colo installation of many, many kilowatts (see below), single phase should be adequate for your needs. This is the definitive measure of electrical power, and is the direct product of multiplying Amps and Volts. Example, if your device draws 2A of current on a 208V circuit, it is using 416W of power. 1000 watts equals one kilowatt. The nice thing about using watts to express power needs: the wattage requirements of your colo stack are constant no matter what the supply voltage. If your equipment stack needs 2kW in operation, it needs 2kW whether the power is delivered as 120V AC, 208V AC, DC, single phase, 3 phase, etc. If you play with the math a bit, you will see that raising the voltage lowers the amount of current your 2kW stack requires to achieve 2kW, and conversely lowering the voltage raises the current required, because watts is always equal to amps multiplied by volts. 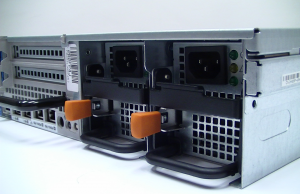 Server with dual power supplies. This is a redundant power configuration. A/B power is typically provided as two separate circuits of identical voltage and rating (see below) delivered to your colocation space. The circuits originate from different segments of the data center’s power infrastructure. To utilize A/B power, each of your pieces of equipment must support two power connections (typically handled by dual power supplies in the equipment), with one connection being made on each circuit. In this way, if one of the circuits fail for any reason, the remaining circuit seamless takes over the load with no interruption of service. For obvious reasons, A/B power costs more than an equivalent amount of single-circuit power (typically referred to as “Primary” power). It is also important to note that with A/B circuits, you are not getting twice the amount of usable power. The total load across the two circuits cannot exceed the amount of load that one circuit could handle on it’s own.